Ephraim "Jock" Dodds (7 September 1915 – 23 February 2007) was a Scottish professional football player. He played in the 1936 FA Cup Final, and, at the time of his death, he was the oldest surviving player to have played in a final at Wembley Stadium. Dodds was born in Grangemouth. His father died when he was two years old. His family moved to Durham in 1927 after his mother remarried. Four years later, at the age of 16, he began his career at First Division Huddersfield Town as a centre forward. In 1934, after just two years with the Terriers, and after a short spell with Lincoln City, he took a free transfer to Second Division Sheffield United. Dodds later became the Blades' leading scorer for four successive seasons, netting a total of 130 goals in just 203 appearances. Big, strong and quick, Dodds worked hard at his game and was duly rewarded. His 100th league goal came in his 154th appearance, against Tottenham Hotspur on 12 September 1938. His last appearance for the Blades came against city rivals Sheffield Wednesday on 4 March 1939. Dodds moved to First Division Blackpool in March 1939 for £10,000, citing family reasons as the source of his transfer request. At the time it was the second highest transfer fee, to the record fee of £14,000 paid to Wolverhampton Wanderers by Arsenal for Bryn Jones. Dodds agreed terms of £6 a week plus a £2 bonus for every first-team appearance. On his move to Blackpool Dodds later said, "It was a lovely sunny day and after the sooty streets of Sheffield I remember thinking it was like coming to paradise." He made his Seasiders debut on 11 March 1939, in a defeat at Charlton Athletic, scoring Blackpool's only goal. He went on to score four in a home win over Middlesbrough and quickly became a favourite. The Second World War intervened, and the Football League programme was abandoned. Dodds joined the Royal Air Force, and was stationed in Blackpool as a PT instructor. He continued to play for Blackpool, with most of his goals in the war years coming in regional competitions. In the North Regional League, he scored 65 goals in 1941-2, and then 47 goals in 1942-3. In 1943, Blackpool beat Sheffield Wednesday over two legs to win the League Cup North, and then defeated League Cup South champions Arsenal 4–2, mainly thanks to right winger Stanley Matthews. He scored eight goals against Stockport County in 1941, and seven goals against Tranmere Rovers in 1942, including a hat-trick in just 2½ minutes. For over 60 years it stood as the fastest hat-trick in the Football League, before James Hayter bettered it by ten seconds in 2004. During World War II, Dodds played guest matches for Manchester United, Fulham and West Ham United. He also made one guest appearance for Clapton Orient, against Queens Park Rangers on 14 October 1944. Orient lost 0-3 before 3,000 spectators. In seven years at Bloomfield Road, Dodds scored well over 200 goals, including 66 in 1941-2 alone. He signed for Irish side, Shamrock Rovers in August 1946 and scored twice on his debut at Milltown on 8 September . In total he played five games, two in the Dublin City Cup and three in the League of Ireland Shield scoring four goals before being sold to Everton in November 1946 for £7,750 . Everton were in desperate need of a centre forward after Dixie Dean retired and Tommy Lawton moved to Chelsea. 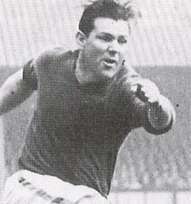 Dodds scored 36 goals in 55 league appearances for the Toffees in 1946-8. He was sold to his former club Lincoln City in October 1948 for £6,000, where he ended his playing career. Dodds was inducted into the Hall of Fame at Bloomfield Road, when it was officially opened by former Blackpool player Jimmy Armfield in April 2006. Organised by the Blackpool Supporters Association, Blackpool fans around the world voted on their all-time heroes. Five players from each decade are inducted; Dodds is in the pre-1950s. Dodds made all eight of his international appearances for Scotland during the wartime period. On 18 April 1942, he netted a hat-trick in a 5–4 win over England at Hampden Park in front of a crowd of 91,000. Bill Shankly hit Scotland's winning goal. After retiring as a player, he tried to recruit players to go to Bogotá, to play in a new league outside FIFA control. He was banned by the Football Association in July 1950 for bringing the game into disrepute, but was later cleared. He decided against taking up positions in football management, and concentrated on business interests in Blackpool, where he said of the town in 1989, "I have lived here ever since [his move from Sheffield in 1939] and love the place." On 22 February 1989 Dodds was given a certificate for his two-and-a-half-minute hat-trick against Tranmere Rovers in 1942, which had for many years been listed in the Guinness Book of Records. "I have been listed in the Guinness Book of Records for years but I never thought about a certificate until I read about a woman receiving one for being the oldest golfer to hit a hole in one. A friend wrote to the GBR asking if I could have a certificate and they sent one to me." Dodds' wife died in 2005, and he died two years later, on 24 February 2007 at Blackpool's Victoria Hospital. At the time of his death he was the oldest living FA Cup finalist, aged 91. ↑ Clarebrough, Denis (1989). Sheffield United:The First 100 Years. Sheffield United Football Club. ISBN 0-9508588-1-1. 1 2 3 Gillatt, Peter (30 November 2009). Blackpool FC On This Day: History, Facts and Figures from Every Day of the Year. Brighton: Pitch Publishing Ltd. p. 37. ISBN 1-905411-50-2. ↑ Gillatt, Peter (30 November 2009). Blackpool FC On This Day: History, Facts and Figures from Every Day of the Year. Brighton: Pitch Publishing Ltd. p. 45. ISBN 1-905411-50-2. 1 2 3 Gillatt, Peter (30 November 2009). Blackpool FC On This Day: History, Facts and Figures from Every Day of the Year. Brighton: Pitch Publishing Ltd. p. 36. ISBN 1-905411-50-2. ↑ Hogg, Tony (1995). West Ham Who's Who. London: Independent UK Sports publications. p. 223. ISBN 1-899429-01-8. ↑ Neilson N. Kaufman, historian Leyton Orient FC. ↑ Singleton, Steve, ed. (2007). Legends: The great players of Blackpool FC (1 ed.). Blackpool: Blackpool Gazette. p. 12. ISBN 978-1-84547-182-8. ↑ "The Hall of Fame – pre 1950's". Blackpool Supporters Association. Retrieved 29 November 2009. Joyce, Michael (2004). Football League Players' Records 1888–1939. ISBN 1-899468-67-6.